Angels can help us in having a good relationship with other people. Each morning we should pray to the guardian angels of the people whom by God’s providence we will meet on that day. If you argue often with someone, pray to his guardian angel so that they will help you both to come to an amicable agreement. We should invoke our guardian angel and the choirs of Powers and Virtues when we feel we may fall into temptation. We can call the angels when we are at the bedside of a dying person. They will help them to have a contrite heart and turn to Jesus who is the only Saviour. If you have children you should often ask their guardian angels to protect them and prevent from all sorts of evil. We are encouraged to carry blessed holy medals of angels around our necks. When we have pictures or statues of angels in our homes, this environment will help us to be more aware of their presence and ask them for help and assistance more often. The real devotion to the Holy Angels should consist in imitating them. The good angels did not commit sin and always did the will of God. In practise, to imitate angels means: walking in the presence of God in the semi-darkness of our faith, doing God’s will, thanking God for all, praising Him for His glory, goodness and love. 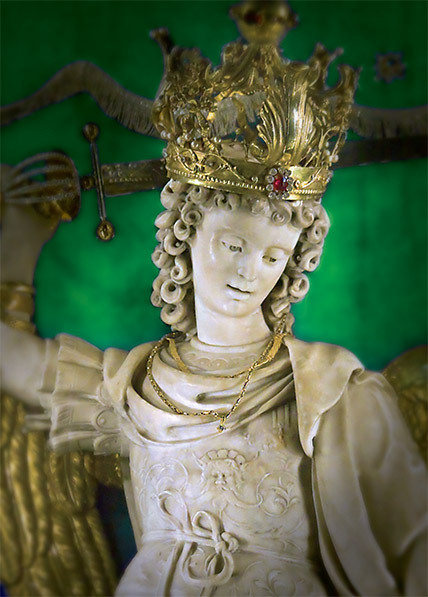 I assure you of the constant daily prayer of the priests of the Congregation of St Michael the Archangel for all our readers and their families. Please let others know about this magazine and help us to distribute it all over the world.